The AmeriGlide Rave distinguishes itself from other stair lifts on today's market with its compact design and easy installation. Sporting a 350-pound lift capacity and a metal-encased rack-and-pinion drive system, the Rave takes up less than a foot of space when folded up, making it the perfect stair lift solution for homeowners with exceptionally narrow stair cases. An adjustable-height padded seat is included for your comfort, as well as safety switches that prevent the lift from moving if any obstruction is present beneath the unit. The track for the Rave mounts directly to your stair case - not your walls! - and uses just one bracket at each point of contact to make installation easier on you or your handyman. 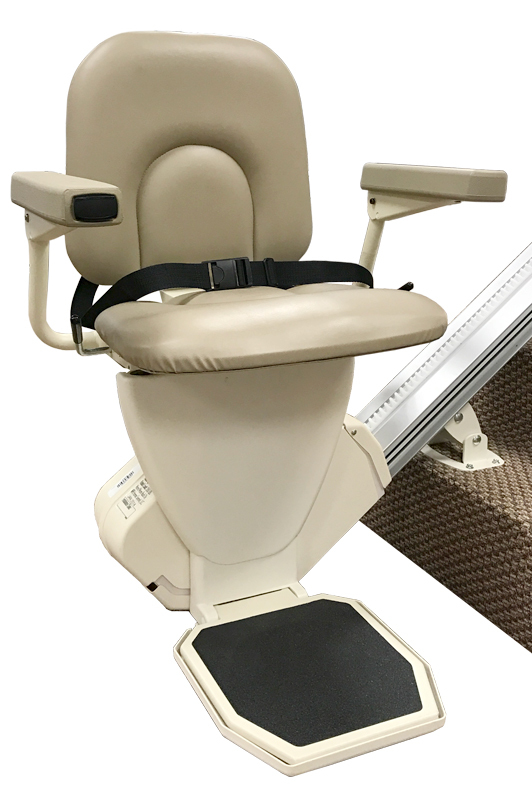 Best of all, every AmeriGlide Rave stair lift is manufactured in the United States of America, so call us today to order yours!